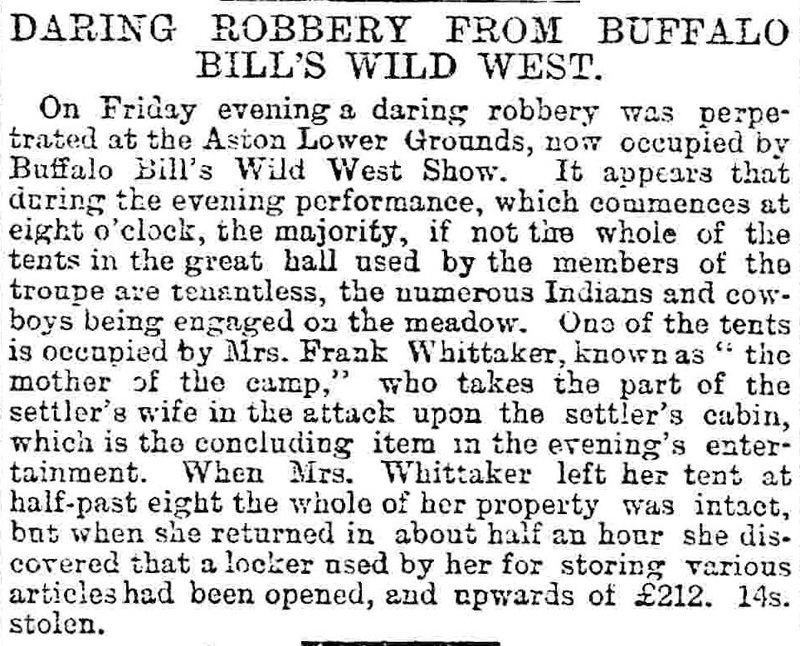 DARING ROBBERY FROM BUFFALO BILL'S WILD WEST. 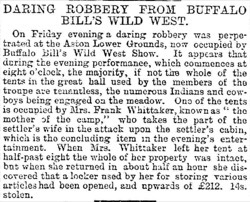 On Friday evening a daring robbery was perpetrated at the Aston Lower Grounds, now occupied by Buffalo Bill's Wild West Show. It appears that during the evening performance, which commences at eight o'clock, the majority, if not the whole of the tents in the great hall used by the members of the troupe are tenantless, the numerous Indians and cowboys being engaged on the meadow. One of the tents is occupied by Mrs. Frank Whittaker,  known as "the mother of the camp," who takes the part of the settler's wife in the attack upon the settler's cabin, which is the concluding item in the evening's entertainment. When Mrs. Whittaker left her tent at half-past eight the whole of her property was intact, but when she returned in about half an hour she discovered that a locker used by her for storing various articles had been opened, and upwards of £212. 14s. stolen.